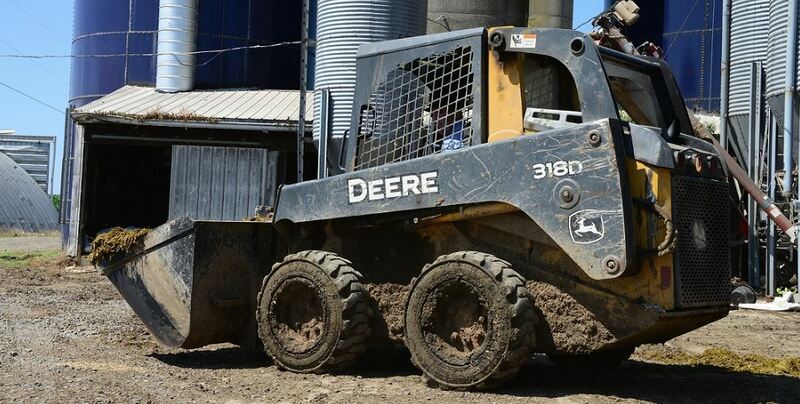 The Tire and Rim Association (TRA) uses a set of standardized codes to categorize tires, and knowing these codes can go a long way in simplifying skid steer tire selection. The most common TRA codes that apply to skid steers are R-4, L-4, and L-5. R-4 tires are designed for industrial use featuring sturdy sidewalls and the capability to handle heavy loads. The L designation found in L-4 and L-5 tires indicates that the intended application is on loaders and dozers while the following number is an indication of tread depth. Tread depth is rated on a scale ranging from one (the lowest) to five (the highest). The majority of skid steers come equipped with R-4 tires, which is why we make our most popular patterns, such as the Galaxy Beefy Baby II and III, Muddy Buddy, and Marathoner with the R-4 designation. R-4 tires are typically best suited to work in dirt and mud, making them a good choice for skid steers on construction sites or in municipal applications. Variances within the tread patterns of our R-4 lineup allow us to supply skid steer specifically built to excel in a variety of applications. For example, our R-4 Galaxy Muddy Buddy is perfectly suited for working in slick environments like those found on dairy farms, while our Galaxy Marathoner features closely spaced lugs for improved performance on hard surfaces. ATG even offers an R-4 radial skid steer tire option, the Alliance 550 multiuse. Radial tires improve control, turn easier, increase fuel economy, and dissipate tire-destroying heat better than their bias counterparts. Our 550s feature a tread equally capable of working on both soft and hard surfaces, and are a fantastic choice for skid steers being used for snow removal. Skid steer tires with the L-4 designation, such as our Primex Bossman Grip II and Galaxy King Kong, feature 1.5 times more tread than L-2 and L-3 skid steer tires. The L category features massive tread blocks instead of the bar tread designs of the R category. L-4 tires are built using durable and long-lasting compounds that are resistant to cutting and chipping, have sidewalls with extra rubber to prevent cuts and snags, and take advantage of high solid-to-void ratios for extended lifespans. Because L-4 tires are built to handle heavier loads and operate in harsher conditions, they cost more upfront than an R-4 tire, but their long service life and ability to maximize uptime allows them to be more cost effective over the life of the tire. L-4 tires are the best choice for skid steers operating in punishing terrain and performing demanding jobs like working on abrasive construction site surfaces or operating in puncture-prone environments such as scrapyards and recycling centers. L-5 tires, like our Galaxy Hulk, are the heaviest-duty pneumatic tire available for skid steers. L-5 tires feature a heavy-duty tread that is 2.5 times deeper than what’s found on L-2 and L-3 tires. Designed for the hardest jobs and the harshest environments, L-5 tires are built using cut- and chunk-resistant compounds and with super-strong sidewalls. Balancing the ruggedness of a solid tire with the ride quality of a pneumatic tire, L-5 tires are best on skid steers operating on the most challenging job sites and performing the most tire-threatening tasks such as working in demolition, scrapyards, and glass recycling. Like L-4 tires, L-5 tires have a more expensive upfront cost than lesser-rated tires; however, L-5 tires in extreme applications will have a lower total cost of ownership, thanks to their ability to reduce downtime and maintenance. Are you still not sure what type of tire you need for your skid steer or simply want to learn more about ATG’s range of skid steer tires? If so, contact your local Alliance Tire Group dealer or ATG rep today.